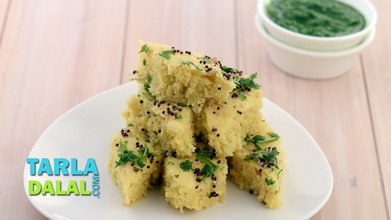 Pucca traditional and perfect to the core, the Moong Dal Dhokla represents everything that dhoklas stand for – sumptuous, tasty and aromatic! 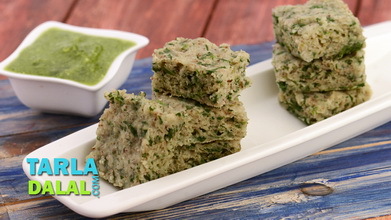 A wholesome batter of soaked and ground moong dal is complemented by ingredients like besan, curds and fruit salt to get the ideal texture and flavour. 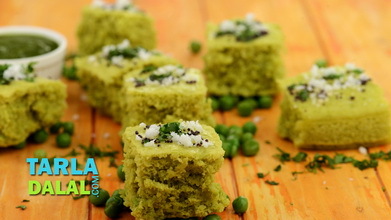 Topped off by an aromatic tempering, the Moong Dal Dhokla becomes a tongue-tickling snack, when matched with peppy green chutney. 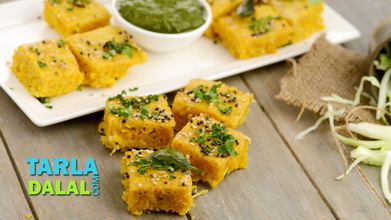 Combine the yellow moong dal and green chillies and blend in a mixer using a little water to make a paste of pouring consistency. Transfer the paste to a bowl, add the salt, sugar, asafoetida, oil, turmeric powder, besan and curds and mix well to make a batter. Just before steaming, sprinkle fruit salt and mix lightly. Pour the batter into a greased 175 mm. (7”) diameter thali. 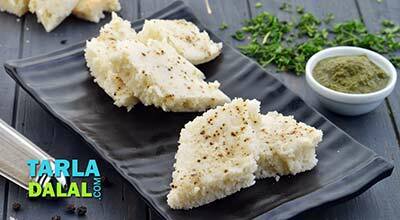 Steam in a steamer for 10 to 12 minutes or till the dhokalas are cooked. Keep aside. Heat the oil in a small non-stick pan and add the mustard seeds. When the mustard seeds crackle, add the sesame seeds, asafoetida and sauté on a medium flame for 30 seconds. Add the green chillies and sauté on a medium flame for 30 seconds. 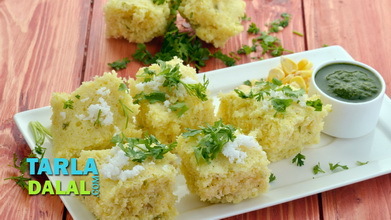 Sprinkle the coriander and coconut evenly on top. 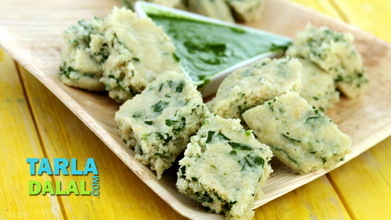 Cut into pieces and serve hot with green chutney. 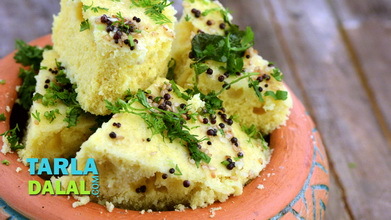 I tried this recipe n moong dal dhokla turned out to be delicious .Thanks for diet friendly receipe which can be given to my son studying in ssc as it''s quick light n tasty. Tarla Dalal Hi Priya, Thank you for your kind words.. Do try more and more recipes and let us know how you liked them..Happy Cooking ! !